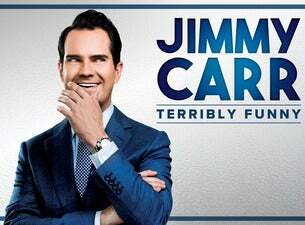 Known for his deadpan delivery and disregard for political correctness, Jimmy Carr has become one of the most successful and prominent stand-up comedians in the UK. Since he began his career in the early 2000s, Jimmy has performed 10 sell-out tours and played over 2,000 shows to over 2.5 million people. In 2016, the award-winning comedian became the first UK comic to record a special for streaming giant Netflix. Jimmy is also a supremely well-known television personality. His credits include the much-loved panel show 8 Out of 10 Cats for 20 series, 16 series of its spin-off 8 Out of 10 Cats Does Countdown and 10 years of presenting Channel 4’s annual Big Fat Quiz of the Year. Not for the easily offended, Jimmy’s shows usually involve poking fun at crude things you’re not meant to make fun of. His brand new show Terribly Funny kicks off in May 2019 and runs into 2020. As the name suggests, it promises to make jokes about all kinds of terrible things that may have affected you or the people you know and love. Remember though, they’re just jokes – joyful little constructs of language designed to make you laugh.